Background: Proctoring by experts in new interventional techniques is a well recognised approach in developing such services in new centres. However, it is not well established if such approach has a long term beneficial effect given these procedures are often complex and expensive with significant demand on resources. Aim:Interventional cardiologists interested in percutaneous coronary intervention (PCI) of chronic total occlusion (CTO) lesions in our centre were proctored in Hybrid techniques by experts in the field in 2011. A significant improvement in success rates in these procedures were observed in the immediate post-proctoring period (6 months). The aim of this study was to determine if such proficiency was maintained over a longer period of time. Methods: Data from the the local BCIS (British Cardiovascular Intervention Society) database was retrospectively analysed for all CTO cases performed during April-October 2015 and January-June 2017. The baseline characteristics of the cases were similar (table 1). Therefore they were analysed as a single cohort to determine procedural success and other differences in characteristics between proctored and non-proctored operators. An independent observer reviewed all the cases to confirm there true CTO status, JCTO (Japanese CTO) score and procedural success. Success rates were compared between proctored and non proctored operators and for cases with low (0-1) and high (>=2 ) JCTO score. T test or Mann-Whitney U test was used for continuous variables and Chi square test was used for categorical variables. A logistic regression analysis was performed to identify the factors most predictive of procedural success. Results: A total of 99 CTO PCI was undertaken during the defined study period which was 63.5% increase compared to previous activity . 80.8% cases were performed by proctored operators which was much higher than before (50.8%). Proctored operators used more screening time (35.7, IQR 22.2-54.3 vs. 21.5, 16.4-28.8 min, P=0.002) and contrast volume (215, IQR 167.5-320 vs 137.5, IQR 107.5-270.0 ml, P=0.025). 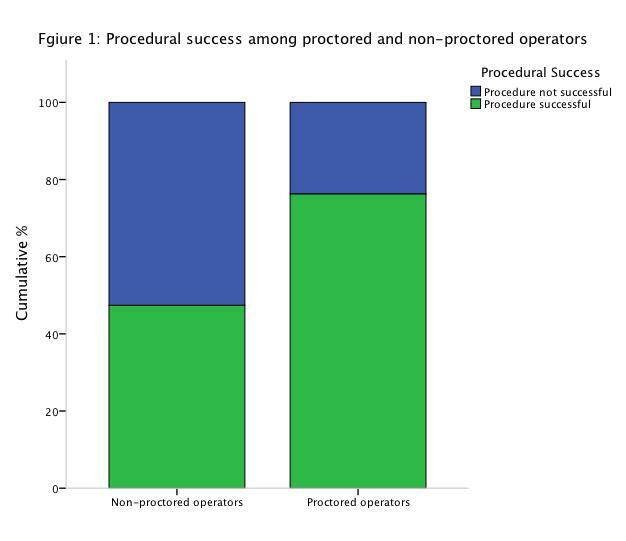 The success rate for proctored operators remained significantly higher (76.3%, N=61/80 vs 47.4%, N=9/19, P=0.013, figure 1) which was comparable to previous data (77.9% vs. 54.3%, P=0.010). For cases with JCTO score >=2, the success rate for proctored operators was 66.7% with a range of 28.6% to 88.0% and a clear relationship to case volume (figure 2). A logistic regression model identified JCTO score and proctored operator as the most significant predictor of procedural success. Conclusion: Proctoring has a long lasting influence on procedural success rates of complex procedure such as CTO PCI and shows both qualitative and quantitative improvement in the service.